Remember Sharon? 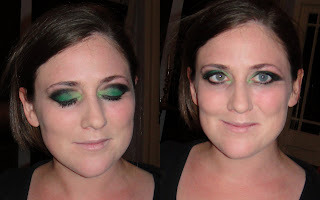 She was going to a Bizarre Ball, and we tested a makeup look for her a few weeks ago. Well, the ball was on Saturday, and we redid the makeup for it. Taking into account what we did last time, I didn’t take the black as far up the browbone this time, and gave it a more pronounced winged shape at the edges. Oh, and I used MAC Greasespaint for the black, much, much easier than a powder. Still love that green! Next Post Organic Wednesday – Makeover Special!